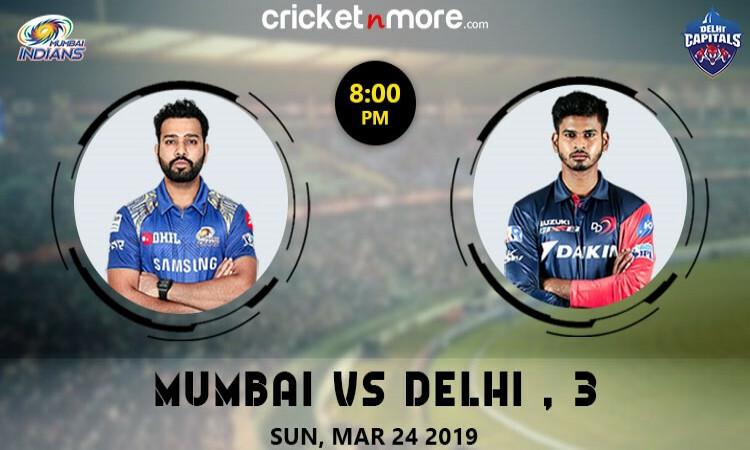 Mumbai, March 23 (CRICKETNMORE): After a disappointing last season, three-time champions Mumbai Indians (MI) will be looking to start afresh when they take on Delhi Capitals in their opening game of the Indian Premier League (IPL) season 12 at the Wankhede Stadium here on Sunday. A lot was expected from Mumbai in 2018, but the Rohit Sharma-led side failed to qualify for the play-offs. However, playing at home in their first game of this season, Mumbai will aim to kick-off their journey on a positive note. With the Wankhede wicket known to be batsmen friendly, the contest promises to be full of runs as both teams boast of some big-hitters. While Mumbai have the likes of Sharma, Hardik Pandya, Quinton de Kock, Kieron Pollard, Ishan Kishan and Yuvraj Singh to smash the ball around, Delhi have quality batsmen in Shreyas Iyer, Rishabh Pant, Prithvi Shaw and Shikhar Dhawan. Not to forget the prowess of Chris Morris at the back end of the innings. Delhi, who have not reached the final of the league even once, have a young skipper in Iyer, who will lead the side from the start of the league after taking over from Gautam Gambhir midway into the last season. The youngster, however, will look to leave the disheartening memories behind as the team has been given a complete new look. Meanwhile, a lot will be expected from local boy Shaw though he will not be representing the home team. The young opener knows the wicket and conditions at the Wankhede like the back of his hand and might prove to be useful if he's picked in the playing XI. Delhi will also look for some all-round performance from Morris, who has been a valuable player for the franchise. Morris' ability to pick up wickets in the middle overs and bowl some deadly yorkers makes him a huge asset for Delhi. Mumbai will expect similar services from Hardik Pandya, who has performed with both bat and ball over the years. The hosts will also look for a blast from Yuvraj. After the southpaw went unsold in the first-round of the IPL auctions in Jaipur, Mumbai showed faith in him and bagged him at his base price of Rs 1 crore. Skipper Sharma is likely to open with Kishan and the duo will aim to give a solid start to the Mumbai innings. Coming to the bowlers, Mumbai have Jasprit Bumrah, Mayank Markande and Jason Behrendorff, among others. While Bumrah and Behrendorff will aim to give some early jolts to the visitors, Markande will be expected to keep things tight in the middle overs. The leg-spinner was amongst the wickets in 2018, scalping 15 wickets in 14 games at an economy rate of under nine. On the other side, Trent Boult, Ishant Sharma and Kagiso Rabada will look after Delhi's pace attack while the spin department will be led by the experienced Amit Mishra. Overall, looking at the two squads, an electrifying clash is on the cards on Sunday.